Radiotracker 6.1 is the most powerful web radio player that able to finds music, records music, cuts the music, adds missing ID3 tags, lyrics, and cover artwork automatically. 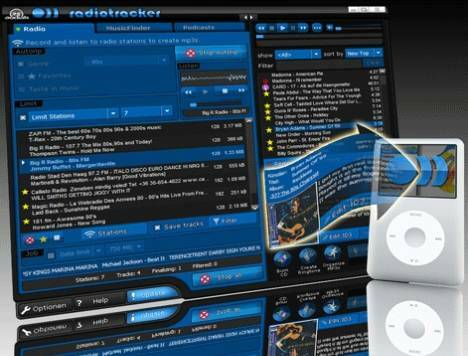 Radiotracker 6.1 also comes with built-in directory of Internet radio broadcasters containing over 14,000 listings, access to 19 music genres, multiple parallel streaming from an unlimited number of Internet radio stations, volume normalization and transition fading functions. In addition, Radiotracker can record thousands of MP3 music tracks for free and legally from all broadcasting radio stations without any commercials or talk. Furthermore, it also can convert music to ringtones, burn to CDs or DVDs, and rips music to MP3 files. MP3 Search Engine with Wish List Function. Download MP3 from internet radio stations. Automatically obtains song lyrics and album artwork. Listen on your PC, or transfer to your portable MP3 player. 19 music genres (Dance/House, Pop, Rap, Rock, Techno, Metal, Jazz, 80s, 70s, R&B, etc.). Music filter (no ads or jingles). Perfect quality through minimum bit rate. Full control of bandwidth utilization. Control recording according to time and memory requirements. Click the “Download” button to download the installer, Radiotracker_6_Standard_Computerbild_online.exe. The installer for Radiotracker 6.1 Standard Edition from Computerbild website will automatically enter a license/serial number that is the same for all downloaders. The serial number or product key is not a unique ID. Continue to run the setup executable to start the Radiotracker 6.1 Standard Edition installation. Once installation finished, you will have valid and legit Radiotracker 6.1 Standard Edition. Note: while starting and closing the program, you will see a window prompting or asking you to buy Radiotracker 6 platinum edition. Just click on “Close” button to ignore it. Radiotracker 6.1 supports Windows 7, Windows Vista, Windows XP, and Windows 2000 (32bit or 64bit).